Earth Shaper is a travel into a fantasy land. A rather colorful travel where most of the times the instruments are equal in conveying the soundscapes to these imaginary places. It could be described by making a reference to Tangerine Dream's Tangram in its essence. We find voluptuous yet simple melodies surfacing here and there amongst waves of sequential rhythmic patterns and chording work. A comparison could locate Earth Shaper inbetween the aforementioned TD album and Jean Pascal Boffo's Carillons. A reverie is in the air, aptly forwarded in mostly open major modes by the keyboards, but also firmly supported by a very present percussive, yet flowing, approach on drums. The downside is that some passages are lacking the biting edge that would make them exceptional. But Fonya manages more often than not to maintain interest, mostly because there's an undeniable sense to the music, a coherence that reveals a direction, held together by a busy yet non-obstructive, flowing instrumentation. This album will be savored by listeners wanting a music that flows nicely by without apparent effort, although capable of letting itself be discovered in detail to an attentive ear. A fine album of instrumental 'vagabondage with a purpose' : a soothing and colorful magical voyage. Fonya continues to be the solo vehicle for multi-instrumentalist Chris Fournier. His latest release is one that builds well on previous efforts, and is simultaneously familiar and accessible, not in the sense of commercial, but in the sense of inviting and approachable. The main instruments tend to be synths (mostly digital, but not unpleasantly so) but Fournier also adds some bass, drums, and guitar to flesh out the soundscape very well. In fact, this sounds more like a full band than almost any other project in this genre. It isn't intended to sound like a solo effort, despite that fact that it is one. The music moves between airy synth passages and addicting riff-based explorations. The highlights are when Fournier grabs a hold of a fluid riff and rides it through some developments. It's been proven over and over again that a full band can do more with this style of symphonic music than a single person usually can, and the same holds true here. Fournier is basically stretched so thin, that the songwriting suffers in places and sometimes just seems like ideas strung together without any larger purpose or sense of development. Furthermore, there aren't really any melodies that are strong enough to remain with you after the music's over. All in all, this is a very ambitious project, and is executed well enough to be recommended with the aforementioned shortcomings. 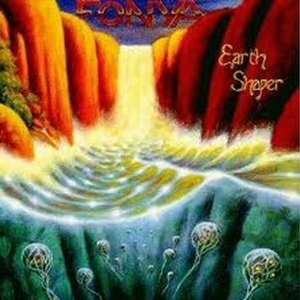 Fonya is Chris Fournier, a multi-instrumentalist adept at making instrumental symphonic progressive rock in a variety of moods. The album is primarily keyboard-based, using modern keyboard sounds as well as Moog and Mellotron (I think). From my standpoint, this is quite an astonishing album, as Fournier avoids the boredom usually associated with instrumental keyboard efforts including enough variety and drama to hold the listener's interest. Earth Shaper includes two noteworthy suites, "The Valley of Lavon" and "Seeing Cape Cod Seas," which alternately find a hypnotic theme and stray away from it. The result is a highly atmospheric mix that combines the technology of modern progressive with the thematic complexity of classic progressive. The addition of ringing Fripp/Latimer style guitar in the background is also a plus. Perhaps if Peter Bardens had rejoined Camel and brought along his new age compositions with him, Camel may have sounded like this. This is not to say Fonya sounds like Camel, but the thematic structure and distinctly progressive chord changes carry that trademark. For those who like a bit of new-age atmosphere with a progressive bent, this album should work just fine.